It won’t be a Chris Froome, Alberto Contador, Tour de France type of showdown, but the final time trial in the Tour of Poland will feature a number of riders within a minute of each other, and the top five overall are separated by less than 30 seconds. Christophe Riblon (AG2R La Mondiale) leads Jon Izaguirre (Euskaltel-Euskadi) by 19 seconds, while Rafal Majka (Saxo-Tinkoff), Sergio Henao (Sky Procycling), and Pieter Weening (Orica-GreenEdge) are just behind. Sitting a little further back are Eros Capecchi (Movistar), Ivan Basso (Cannondale), Robert Kiserlovski (Radioshack-Leopard), and Alex Howes (Garmin-Sharp). These are the riders who have outlasted the rest in what has been a grueling Tour of Poland, which started with two mountainous stages in Italy. Friday’s stage six featured five laps of a circuit that contained three big climbs, and totaled almost 200 kilometres in length. Whoever conserved the most energy over such a difficult stage, and recovered the best overnight, will have the upper hand in today’s ongoing test. Recovery was the topic about which to talk among riders and sporting directors after stage six. 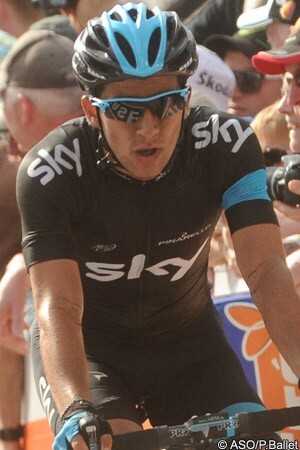 “Sergio's still right up there on the GC, so that's great news for us,” said Henao’s Sky Procycling director Dan Hunt. “Everybody was completely worn out at the end of [stage six] so fair play to Riblon for taking the lead, and [Darwin] Atapuma for his win. Sergio will rest up as best he can now and he's really motivated to put in a good ride. He's still in the mix, but Riblon, Basso, and Kiserlovski can all time trial as well so it'll be an interesting end to the race. Weening is having a solid season for Orica-GreenEdge, having performed well in the Giro d’Italia. The Dutchman is now an outside bet for the overall in the Tour of Poland. “Everybody is still close together in the top ten overall. The race is not decided yet,” Weening insisted. “I have to do a good time trial to get a good result. I’m ready to give everything and see how it goes. A lot about [the TT] will depend on recovery. The guy who recovers the best has a good chance of going the fastest. There’s no one in the top ten that’s a pure time trial specialist, but some can do the time trial better than others. For Saxo-Tinkoff, Rafal Majka sits third overall, while team-mate Chris Anker Sörensen is tenth. Saxo-Tinkoff has been defending Majka’s GC position all week, and did some of the work again on Friday. Former world champion Fabian Cancellara (Radioshack-Leopard) currently has the best time over stage four winner Taylor Phinney (BMC Racing) in the 37km test. Cancellara clocked a 47’32”, 18 seconds quicker than the American. All the general classification favourites have yet to start.